Umbrella cockatoos are also known as white cockatoos. Caring for a baby umbrella cockatoo requires you to devote time and patience to your new pet. The most important things a baby cockatoo needs are the right cage, the right food, appropriate attention and routine. If you provide all these things, you'll make a great umbrella cockatoo parent. Place the cage in a room that meets your bird's requirements. She should be where she can interact with the family and is safe from sudden changes in temperature. She must be in a spot where her strong beak cannot do too much damage to the environment outside her cage. Cockatoos need 10 to 12 hours of sleep a night, so choose a room that will provide this many quiet hours per day. Prepare the cage for your baby bird's arrival. The cage should be the right size for a full-grown umbrella cockatoo -- at least 2 feet wide and 3 feet high. Your bird should be able to stretch her wings fully without touching the sides of the cage. Stock the cage with toys, perches, food and water before bringing your baby bird home. Pad the bottom of the cage. This protects the baby bird if he falls. Falls on a hard cage floor can cause serious injury or even be lethal for a baby bird. A layer of unprinted newsprint, followed by towels, then another layer of newsprint will provide adequate cushioning to the cage floor. Feed your baby cockatoo parrot pellets, as well as fresh fruits and vegetables. Umbrella cockatoos should only eat nuts and seeds occasionally as a treat. Cut fresh foods into small pieces your birdie can easily pick up in her beak. Make the food easily accessible to your baby cockatoo. Position the food and water bowls in a place where your bird often spends time so she can eat comfortably. Choose foods for your cockatoo that meet her nutritional needs. Vitamin A and calcium are especially important to your umbrella cockatoo's diet. He can get these naturally from fresh food, so a supplement is not necessary. Vegetables like broccoli and kale add calcium to your cockatoo's diet. Fruits and vegetables such as sweet potatoes, pumpkin, carrots and apricot are good sources of Vitamin A. Follow a set routine to make your umbrella cockatoo feel comfortable and adjust to her new home. Follow a regular schedule for wake-up time, feedings, play time and bedtime. Being able to predict the day's activities will help put your bird at ease. Respect your cockatoo's space and comfort level when introducing her to her new home. Birds view humans as predators until they develop a bond of trust. Approach your bird's cage slowly and speak in a calm, soft voice. If your bird shrinks away from you, slowly back off and try to interact with her again later. Let your cockatoo set the pace for how soon you'll be able to approach and handle her. Avoid flooding your baby cockatoo with attention at first homecoming. Instead, from the first day provide your bird with the amount of attention you expect to give her in the long term. Cockatoos can become depressed if there is a sudden decrease in the attention they receive. Involve all family members in the bonding process. Every member of the household should partake in your umbrella cockatoo's care and should make an effort to establish trust with your bird. Play with your cockatoo regularly and provide entertaining toys. Umbrella cockatoos are very intelligent birds that need stimulation and activity. Choose a mix of indestructible and destructible toys to keep your cockatoo entertained. Rotate toys every two weeks to keep your baby bird interested. Train your bird with simple commands, such as "step up" and "go home." These training sessions will not only develop the bond between you and your cockatoo, but will help manage her behavior. Umbrella cockatoos have very strong beaks, so a stainless steel cage is the best choice to prevent your bird from chewing his way to freedom. Use sandblasted manzanita (a highly durable wood) for perches, as untreated manzanita is too slippery for juvenile birds' feet. 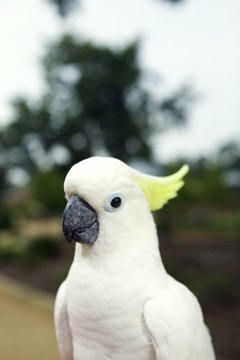 Foods and beverages that are toxic to your umbrella cockatoo include avocado, chocolate, carbonated drinks, caffeine and alcohol. Hand-fed babies should be weaned onto dish feeding as soon as possible. Continued hand-feeding can lead to the bird becoming overly dependent on you. Do not become overly affectionate with your cockatoo. Cockatoos associate affection with breeding partners. If your bird is overstimulated, this can result in frustration and aggression.